The American Kestrel is a member of the Falcon Family. The bird has a tan back and tail and a black and white pattern around the eyes. Females (such as the one in the photo below) have a lighter colored breast than the males. Males have a brown chest and blue-gray wings. The American Kestrel lives in open habitats such as grasslands and deserts. It eats mainly insects which it typically hunts in the morning and evening hours. They live in cavities instead of nests using holes in trees and saguaros for a home. 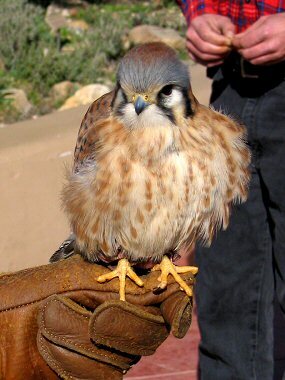 The American Kestrel is the smallest falcon in the US and has a wingspan of less than 2 feet across. Females lay one clutch of 4-5 eggs per year. Once they hatch, both parents share duties in raising and feeding the chicks, which typically leave the nest (fledge) after 30 days.